I ran my first obstacle race in June and ever since that day I have been wanting to get my entire family involved in the sport. That wish came true at the Midwest Spartan Sprint. I was a little concerned at first because I wasn’t quite sure how my wife would react to a sport involving mud and dirt, and required a gritty, scratching & clawing attitude to get to the finish line. I shouldn’t have worried because after she participated in a Warrior Dash in September, she was hooked just like me. After that she was determined to take on a Spartan Race. She knew that the Spartan Races were more difficult and challenging, but I didn’t really tell her exactly HOW much more difficult they were. That’s partly because I didn’t want to scare her into not doing it and partly because I just can’t adequately describe it in words. As soon as I crossed the finish line at the Midwest Sprint, my thoughts immediately turned to the rest of the day and how my wife and 7-year old daughter would fare. The only tip that I gave my wife before she got in the race line was to take the gloves off at the monkey bars. Other than that, I wasn’t about to describe the rough terrain and ridiculous obstacles. She would find out soon enough. She took off and all I could do was wait until she returned and spend some time with my daughter who was set to race in an hour and a half. My daughter wanted to do two things: buy a Spartan Kid t-shirt and meet Carrie Adams who she had watched countless times on some of the Spartan TV videos. Carrie was gracious enough to take a picture with her and my daughter’s reserved personality became evident as she timidly posed for the photo. It sort of reminded me of when I met Sesame Street’s Big Bird when I was her age……except she didn’t get scared like I did! I wanted to be at the finish line to watch my wife battle the gladiators, but the little one was anxious to get in the race line. I granted her that wish because I was really concerned that my Spartan spouse wouldn’t be finished in time to watch the Kid’s race. I was slightly surprised when, 5 minutes before the race started, my wife came huffing and puffing over to me with a look of exasperation on her face. “That was soooooooooooo hard” she gasped and then proceeded to tell me about her biggest challenges like almost getting stuck in the first waterhole and the rope climb! It was then that I thought she would never run another Spartan Race, so I trepidly asked her if she liked it and would do it again. “Heck, yeah! !” she said, and my heart did a little flip! She had actually turned it up a couple of notches and pushed herself hard in order to finish in time to see my daughter race. It’s amazing what a parent will do for a child. When the results came in, she had finished 8 out of 109 females in her heat and 51 out of 219 overall. She got to brag a little about “chicking” some guys along the way! 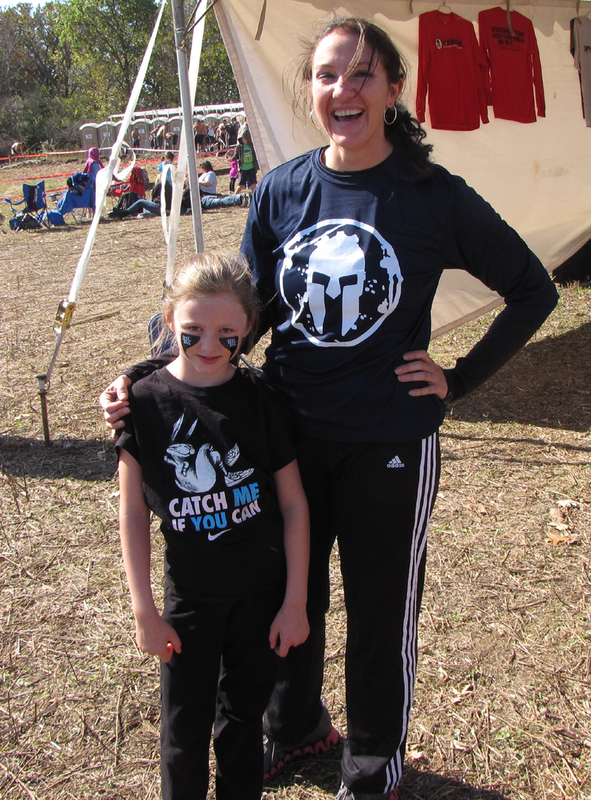 Now we could both fully turn our attention to the Spartan Kids race which is for children/youth ages 5 – 13. This is really a tremendous event for our youth. They get to experience a much safer and shorter obstacle race than their parents, but still come away with a sense of accomplishment and hopefully, a love for the sport. The obstacles were similar to the regular course with cargo nets, mud crawls under twine, water, walls, etc… My daughter had trained for the race and couldn’t wait to have a go at it. Of course, my parents, wife, and I were probably even more excited than she was. I was really proud of her that she started near the back of the line and still chicked some little boys along the way. However, she was also careful to not run over any smaller kids who got in her way. Like her daddy, she did have one small mishap where she fell face first over the wall climb. She got right back up, though and took off again. The end of the race was really neat. A gladiator was poised before the finish line, complete with pugil stick, but as the kids neared the finish, they were given water balloons to launch at him so that he couldn’t knock them down. After she finished the race, I gave my little one hugs and asked her if she liked it and it was a definite “yes”. She then recounted parts of the race and described how some little kids clock-blocked her. However, she prefaced that with “it’s okay though, because they didn’t know any better”. I just love her! So there you have it. 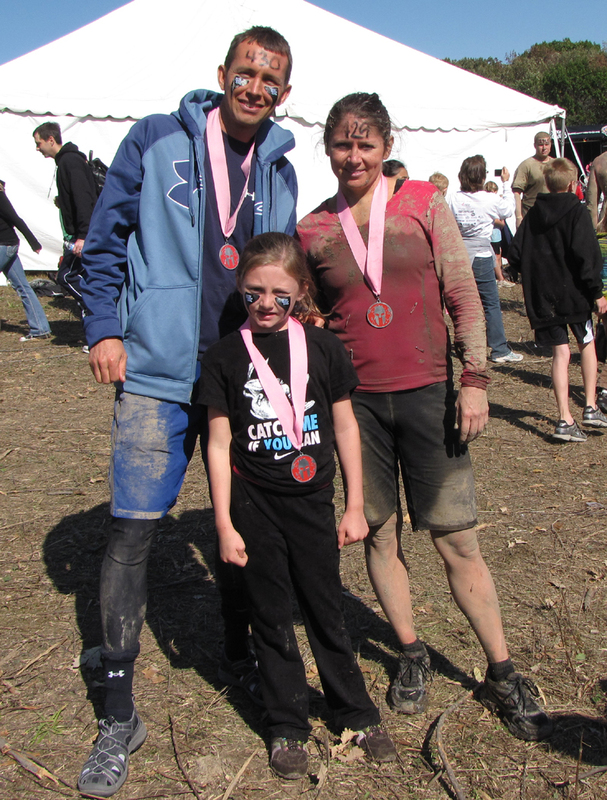 My entire little family is now full of Spartans and we’re in the process of determining potential races for next year 2012. P.S. If you have an opportunity to involve your spouse or child, I highly recommend it. Although I love to race, the experience is so much better when shared with family.